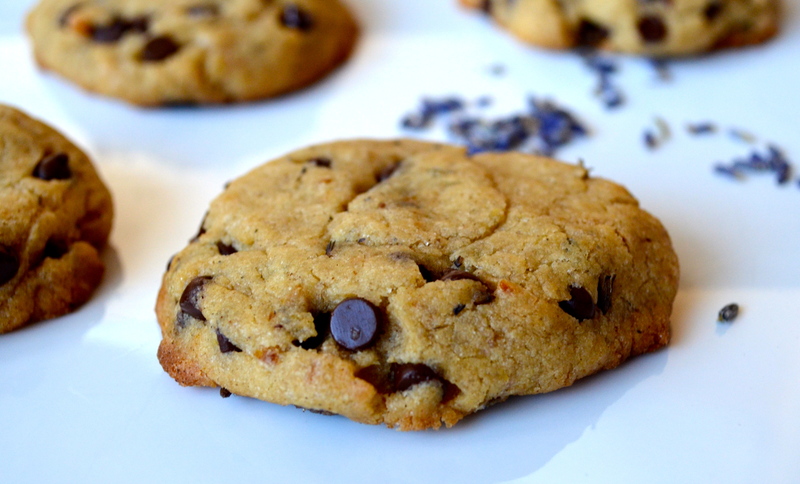 Fragrant, floral lavender adds complexity to this classic chocolate chip cookie. These are a direct adaptation from our “family” recipe, but gluten-free and vegan (and a touch a lavender). Be sure to use lavender that’s meant for cooking/baking. You can get Culinary Grade Niagara Lavender locally at NEOB Lavender Boutique in Niagara-on-the-Lake. 1/2 teaspoon (3mL) xanthan gum. Put the water and flaxseeds in a small bowl. Mix to combine. Let sit until thickened, about 3 minutes. Put the flour, baking powder, and salt in a small bowl. Whisk to combine. Put the lavender and 1 teaspoon (5mL) of the sugar in a mortar. Use the pestle to crush and combine the mixture until the buds are broken and the mixture is fragrant. Put the remaining sugar, vegan buttery spread, and brown sugar in the bowl of a stand mixer or a large bowl. Using the stand mixer or a hand mixer, beat until light and fluffy, about 5 minutes. Add the vanilla extract and lavender mixture. Beat to combine. Add the flour mixture. Beat to combine. Stir in the chocolate chips by hand. Drop the mixture in heaping tablespoonfuls on the prepared baking sheet, press down slightly. Leave about 2-inches of space between each portion. Bake for 10 to 12, until edges start to brown. Let cool on the baking sheet for about 5 minutes. Transfer to a cooling rack to cool completely.